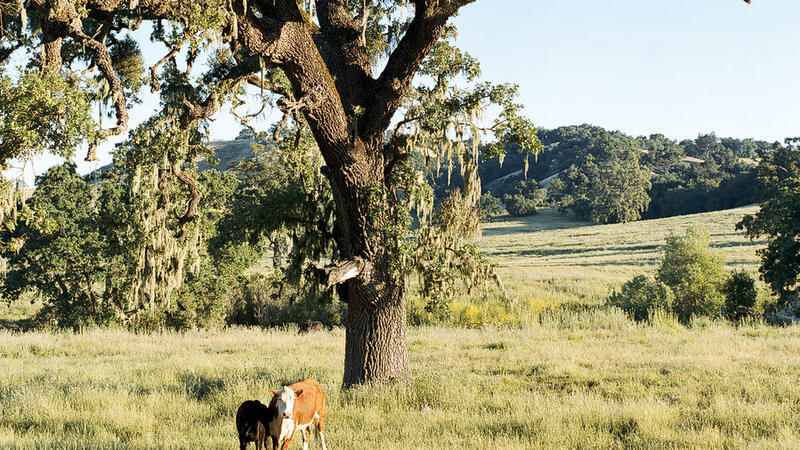 Pastures near Justin Winery in Paso Robles wine country. Getting there: Paso Robles is off U.S. 101, about 3 hours north of Los Angeles and 3 hours south of San Francisco. For more information on wine touring, contact the Paso Robles Wine Country Alliance (800/549-9463). Paso Robles has become one of California’s most exciting wine regions. Ten years ago, there were perhaps 35 wineries here. Today there are more than 200. And the wines they make are garnering increasing acclaim. The region is a major player in California winemaking. But it also retains its cowboy informality. It’s the wine region for people who want good wine but no crowds, who seek good dining and open roads. The wine region for the rest of us. Hospice du Rhône World’s largest international tasting of wines made from Rhône varieties. Apr 28–30, 2011; from $100; Paso Robles Event Center, 2198 Riverside Ave.; hospicedurhone.org or 805/784-9543. Paso Robles Wine Festival Largest outdoor tasting focused on the Paso Robles appellation; over 90 wineries in the downtown park. Third weekend in May; from $55 for unlimited tasting; Paso Robles Wine Country Alliance; 800/549-9463. Paso Robles Zinfandel Festival Featuring tastings from 50 wineries. Third weekend in March; from $55 for unlimited tasting; Paso Robles Wine Country Alliance; 800/549-9463. Harvest Wine Weekend Celebration of the new vintage at a series of open houses. Third weekend in October; fees vary by winery; Paso Robles Wine Country Alliance or 800/549-9463. Manmade caves shelter the 1,700 barrels at Eberle Winery in Paso Robles. Adelaida Cellars Their Viking Estate Syrah has recently won accolades along with their HMR Estate Pinots planted on the region’s oldest Pinot Noir vines. $10 tasting fee; 5805 Adelaida Rd. ; adelaida.com or 800/676-1232. Denner Vineyards Taste beautifully crafted Rhône varieties in the hilltop, modern winery. The Viognier is especially balanced and yummy. $10 tasting fee; 5414 Vineyard Dr.; dennervineyards.com or 805/239-4287. Eberle Winery Syrah king Gary Eberle’s east-side winery has 16,000 square feet of caves and a sweeping view. No tasting fee, free tours; 3810 State 46 E.; eberlewinery.com or 805/238-9607. J. Lohr Vineyards & Wines Make a point to taste the Cabernet from the Hilltop Vineyard, viewable from the light-filled tasting room. $5 tasting fee for their Cuvée wines, other tastings free; 6169 Airport Rd. ; jlohr.com or 805/239-8900. L’Aventure Winery The “adventurer” here is Frenchman Stephan Asseo, whose Cabernet and Syrah blends have become cult wines in these parts. Closed Mon–Wed except by appointment; $10 tasting fee; 2815 Live Oak Rd. ; aventurewine.com or 805/227-1588. Linne Calodo Some of the region’s most interesting red blends are poured in this sleek, new tasting room. $10 tasting fee; 3030 Vineyard Dr.; linnecalodo.com or 805/227-0797. Meridian Vineyards One of Paso’s biggest and best-known producers, but in the picturesque stone winery you can taste some limited-release wines not available in the marketplace. Beautiful grounds. Tasting fee from $5; 7000 State 46 E.; Meridian; 805/226-7133. Peachy Canyon Winery Zinfandel is the signature wine here; don’t miss the one labeled “Especial.” The building that houses the tasting room―the Old Bethel School House―dates back to the 1880s. 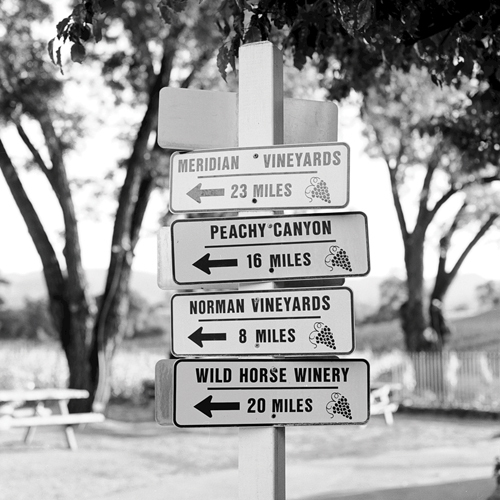 $5 tasting fee; 1480 N. Bethel Rd., Templeton (6 miles south of Paso Robles); Peachy Canyon Winery; 805/239-1918. Robert Hall Winery An arched showplace on the east side, Robert Hall offers plenty of yummy chocolate and Merlot tastings. The wraparound tasting bar gives way outside to a terrace with rich views and not one but two bocce courts. $8 tasting fee for reserve wines, other tastings $5; 3443 Mill Rd. ; Robert Hall Winery; 805/239-1616. Tablas Creek Vineyard The white and red Rhône blends at the ridge-top tasting room are groundbreaking and delicious. Don’t miss the unusual Vin de Paille Sacrerouge 2006, made with only Mourvèdre grapes. $10 tasting fee, free tours; 9339 Adelaida Rd. ; tablascreek.com or 805/237-1231. Thacher Winery Pair a picnic with the 2007 Triumvirate Reserve Zinfandel, which has won three gold medals so far in 2010, from one of the best vineyards on the west side, and take home their 2007 Controlled Chaos, a 2010 San Francisco Chronicle double-gold-medal winner. Closed Tue–Thu except by appointment; $7 tasting fee; 8355 Vineyard Dr.; thacherwinery.com or 805/237-0087. Turley Wine Cellars Larry Turley makes cult wine out of Paso Zinfandel. If you’re a Zin fan, you have to try his. $10 tasting fee; 2900 Vineyard Dr., Templeton (6 miles south of Paso Robles); turleywinecellars.com or 805/434-1030. Wild Horse Winery & Vineyards An interesting stop for the wide range of wines, including Pinot Noir. Just don’t feed the llama; it spits. $10 tasting fee; 1437 Wild Horse Winery Court, Templeton; Wild Horse Winery & Vineyards; 805/788-6300. Hills around Justin Winery grow lush with Cabernet Sauvignon grapes. Hotel Cheval Natural luxury right downtown, in a horse-themed warren of rooms set around a central courtyard fitted with cozy wood-burning fireplaces. The Pony Club wine bar downstairs pours interesting local wines. 16 rooms from $350; two-night weekend minimum; hotelcheval.com or 805/226-9995. La Bellasera Hotel & Suites Large, comfy Italian-style rooms, some with spa tubs and fireplaces to spice up late-night local-wine sipping. 60 rooms from $199; labellasera.com or 805/238-2834. Paso Robles Inn Tile-roofed hotel in downtown Paso Robles. Steakhouse ($$$) and coffee shop ($) too. 98 rooms from $199; pasoroblesinn.com or 800/676-1713. SummerWood Inn At SummerWood Winery, a beautiful farmhouse-style inn set among gardens, with one of the best breakfasts in the region, plus gourmet appetizers and wine in the afternoon and homemade dessert and coffee in the evening, all prepared by a professional chef. 9 rooms from $279; two-night weekend minimum; summerwoodwine.com; 805/227-1111. The JUST Inn Justin Winery’s sumptuous inn. Excellent restaurant called Deborah’s Room, with prix fixe and à la carte offerings ($$$$). 4 suites from $375, including full breakfast; two-night weekend minimum; justinwine.com or 800/726-0049. Artisan Inventive, local-grown American contemporary fine dining. Save room for their outstanding seasonal desserts. $$$; 1401 Park St.; 805/237-8084. Bistro Laurent Hearty French in downtown Paso Robles. $$$; closed Sun–Mon; 1202 Pine St.; 805/226-8191. McPhee’s Grill A first-rate restaurant featuring local ingredients and local wines. $$$; 416 S. Main St., Templeton; 805/434-3204. Meritage Wine Tasting Lounge Right on the old town square, Meritage pours some well-known Paso labels (Hope Family, SummerWood), with crostini and pizza to consume alongside—and live music on the occasional Friday or Saturday night. $; closed Tue; 810 11th St.; meritagelounge.com or 805/238-9456. Thomas Hill Organics Market Bistro The petite bistro showcases the best of the Central Coast in a creative, seasonal menu with a superb wine list and a memorable cheese platter. $$$; closed Tue; 1305 Park St.; 805/226-5888. Villa Creek Early California cuisine and a soothing courtyard. $$$; 1144 Pine; 805/238-3000. Vinoteca Wine Bar A cozy spot with a great selection of local wines and tapas. $$; closed Sun; 835 12th St.; 805/227-7154.